Randy Kaplan is a Long Island real estate lobbyist by day, but on the side he’s a dedicated autograph hunter whenever the UN General Assembly is in town. He’s already acquired 350 signatures from current and former heads of state such as Nelson Mandela and Pope Francis — all on baseballs. Kaplan’s been collecting autographs since he was a teenager — rock’n rollers, celebrities, athletes, etc. But his signed baseball collection didn’t get off the ground until he saw former President George H. W. Bush and his wife Barbara at a Houston Astro’s game in 1993. He managed to nab an autograph on a scorecard, but quickly realized he “committed a major error” by not having H.W. sign a baseball. Fast forward to 1996, when he convinced sitting president Bill Clinton to sign one, and boom, The Kaplan Collection was born. (He later managed to get Bush Sr. to sign a ball). Kaplan calls his hobby “diplomacy through baseball,” and we witnessed him cajole, call out, and shake hands with anyone he thought might be a passing diplomat, searching for that sweet spot to gain access to whichever world leader might be lurking in the wings. This involved a lot of waiting, a lot of staking out, and a lot of explaining the WTF notion of signing a baseball to people who have probably never seen one up close. But to Kaplan, it’s all in a day’s work, and all about getting the next score. 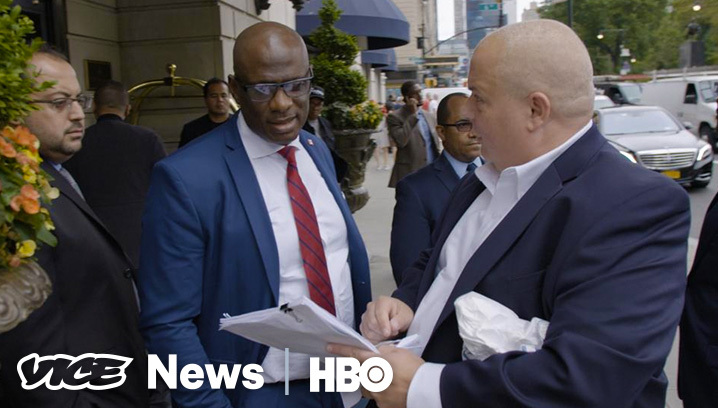 VICE News join Kaplan during the UN General Assembly as he meets the Norwegian Prime Minister for the latest ball-o-graph.